They are running them around like a gaggle of baby ducks. Climbing down from earlier soaring rhetoric, Trump told CBS this week that “I’m in no real rush. I mean whatever it takes, it takes,” he said. 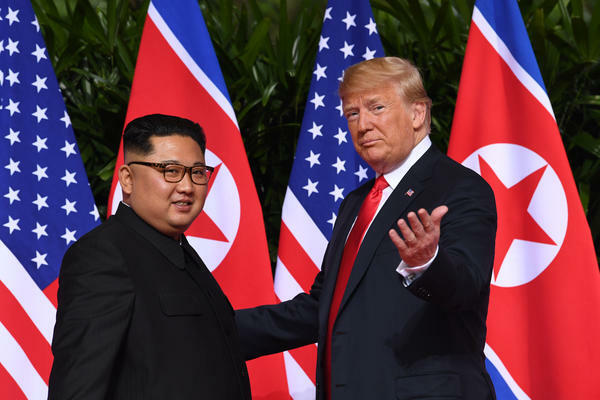 U.S. officials familiar with the discussions said the North pledged to return 55 sets of remains on July 27, the 65th anniversary of the signing of an armistice that ended the war. But Pentagon officials, who sent transit cases to the demilitarized zone weeks ago, are wary of North Korea’s pledges given its previous cancellations. Too bad about that Iran deal, eh? The biggest danger in all this is John Bolton who said ahead of time that it would be good to hold the summit in order to show they tried and then go for regime change when it doesn't work. We had better pray that Bolton being exposed to the lunacy of Trump has tempered his attitude about this stuff. I can't believe I just wrote that. But honestly, I think it's our best hope.